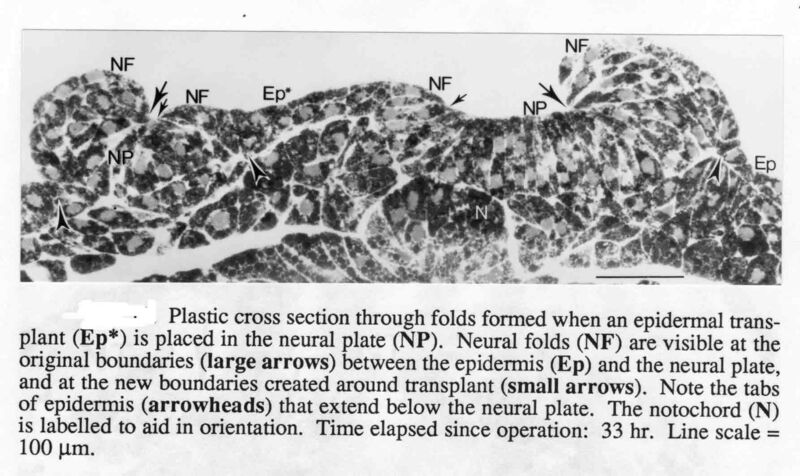 In our studies of neurulation, we described how the neural plate cells, at their contact with epidermis, crawl beneath the epidermis, raising a neural fold. I suggested to David Moury that these data imply that a neural fold should arise between any piece of neural plate surgically transplanted against any piece of epidermis. Moury's doctoral research immedietly confirmed this implication. Moury used embryos of the salamander Ambystoma mexicanum, the Mexican axolotl. 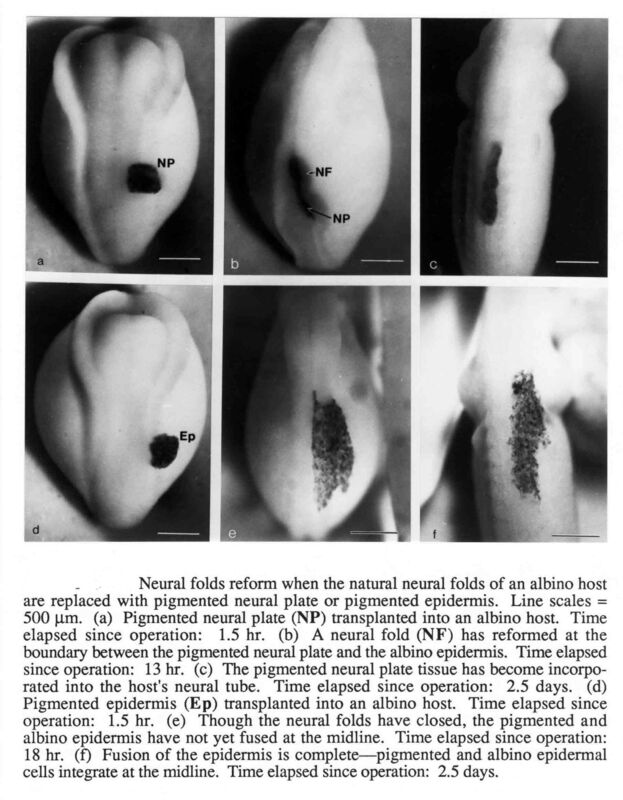 The publication of this part of the work is: Neural Fold Formation at Newly Created Boundaries between Neural Plate and Epidermis in the Axolotl, J. David Moury and Antone G. Jacobson (1989) Developmental Biology 133:44-57. 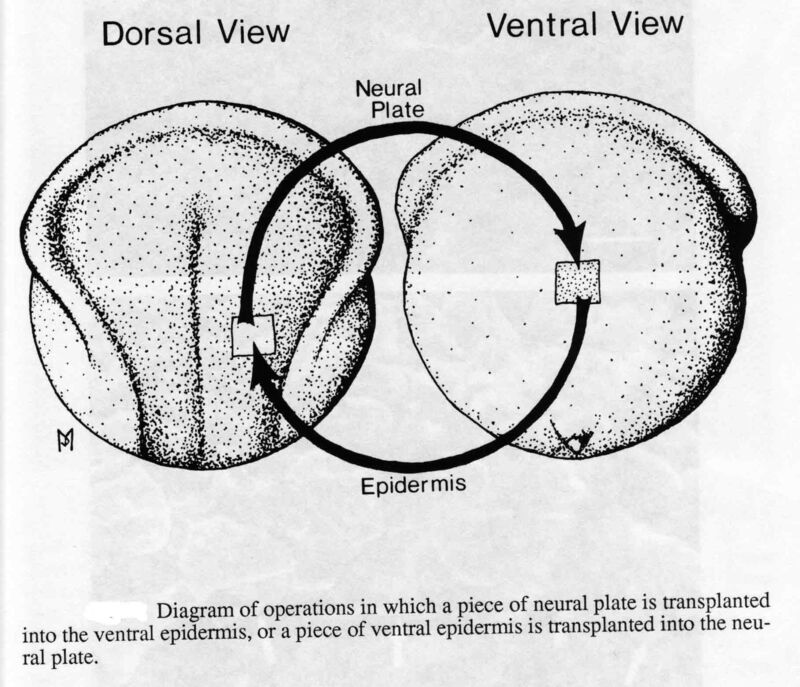 The figure above shows how operations were done to transplant a piece of the neural plate into the ventral epidermis, or a piece of ventral epidermis into the neural plate. These operations were not done simultaneously. To distinguish donor tissue from host tissue, one of the two embryos would be normal with dark egg pigment, and the other embryo would be an albino with no pigmentation. In all cases, the new boundary between neural plate and epidermis formed neural folds surrounding the implant. 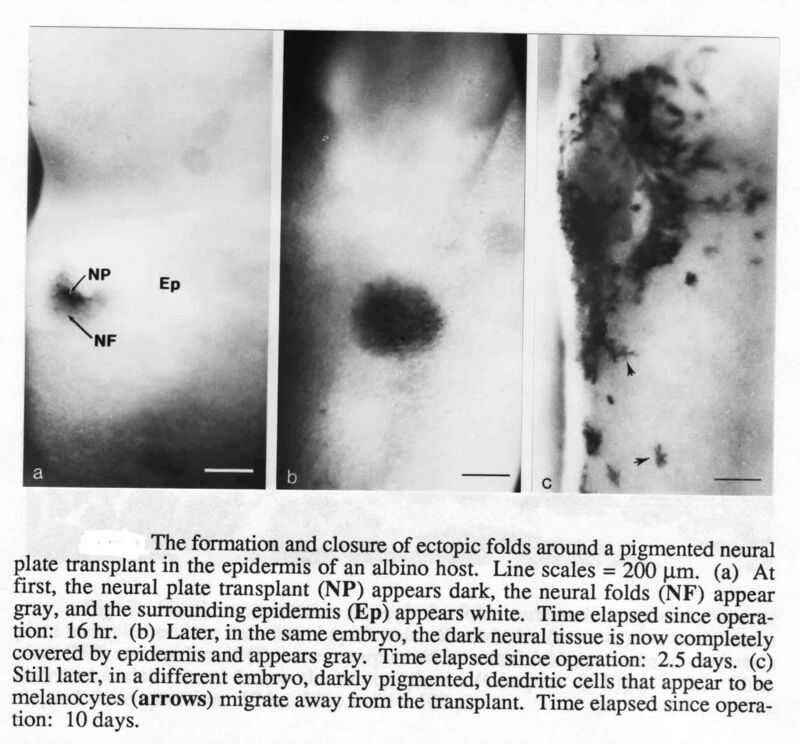 This is illustrated in the figure below for an implant of neural plate from a normally pigmented embryo into the ventral epidermis of an albino embryo. The new boundaries made neural folds all around the implant, and these folds closed the implanted neural plate into a spherical vesicle. The new folds produced neural crest derivatives, in this case pigmenented melanocytes (see c above). These pigment cells had to have come from the normal (pigmented) implant of neural plate. An example of neural folds formed when a piece of epidermis is implanted into a neural plate is shown below. Such epidermal implants always expand rather than contract as surrounding neural plate contracts. We conclude that interactions within any created neural plate-epidermal boundary will form neural folds. The second part of the Moury study addressed the question of whether neural crest cells originate from the neural plate, the epidermis, or from both of these tissues. Many authors had asked this question with conflicting answers. This part of Moury's work is published at: The Origins of Neural Crest Cells in the Axolotl, J. David Moury and Antone G. Jacobson. (1990) Developmental Biology 141:243-253. Using normally pigmented and albino embryos to distinguish the source of pigmented cells made it possible to discern the source of neural crest cells formed in the new folds. 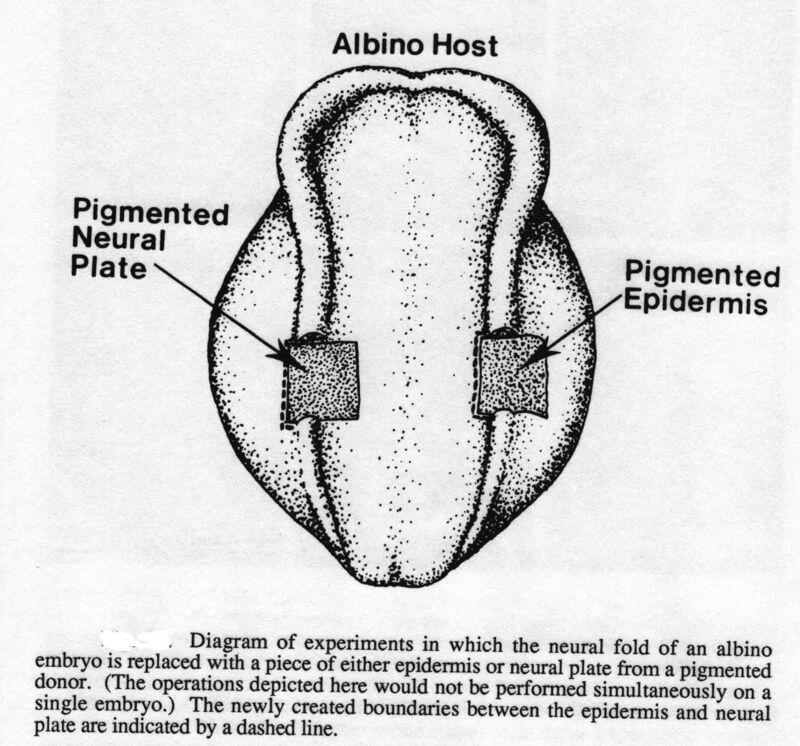 The figure below shows the transplant in place of a piece of the albino host neural fold of pigmented neural plate or epidermis. An overview of such transplants is shown below. 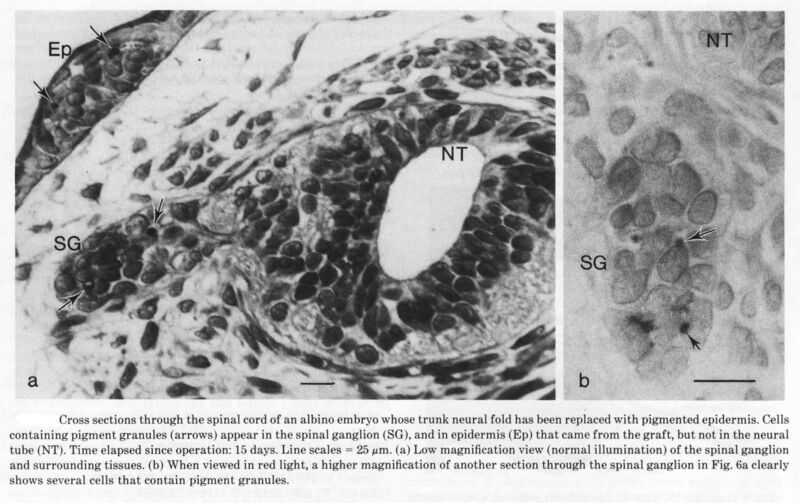 Below is a picture of a section through the transplant region of an albino embryo that received an implant of pigmented epidermis in place of a piece of host neural fold. Pigment granules from the epidermal implant are found in the epidermis from the implant, and also in neural crest derived cells in the the spinal sensory ganglia. We conclude that neural folds that form at the boundary between neural plate and epidermis produce neural crest cells derived from both the epidermis and the neural plate. We suggest that there is a reciprocal induction of both fold and neural crest at these created boundaries.